U.S. Defense Secretary Ash Carter, right, is greeted by Saudi Arabian Assistant Minister of Defense Mohammad Al-Ayesh, center, as Tim Lenderking U.S. Embassy Deputy Chief of Mission stands left, after his arrival in Jiddah, Saudi Arabia, July 22, 2015. U.S. Defense Secretary Ash Carter said Wednesday that Saudi Arabian leaders have assured him they support the historic accord to restrain Iran's nuclear program. The American defense chief met King Salman, Saudi Defense Minister Mohammed bin Salman and other officials in Jeddah and later told reporters that the Saudis approved of the deal with Tehran. Saudi state television showed video of the closed doors meetings, after which no news conference was held, as Saudi leaders generally do not take questions from the press. "Both the king and the minister reiterated their support for the Iranian nuclear deal, and then we went on to discuss other aspects of our concerns about Iran and about ISIL," Carter told reporters, adding that the king is expected to visit Washington this fall. Saudi officials had neither publicly condemned nor supported the Iranian pact in the week since it was announced. However, news accounts in recent days said Riyadh officials feared the pact would increase regional rival Iran's standing in the Mideast, further unsettling the volatile region as economic sanctions against Tehran are lifted in the coming months, giving it new cash reserves. The American defense chief said the only concerns the Saudi leaders voiced about the deal centered on the ability of international inspectors to verify that Iran is living up to its agreement to not build a nuclear weapon and the "snapback" of the sanctions against Tehran if it violates the deal. Saudi analysts and commentators have expressed worries over the eventual rapprochement between the United States and Iran following the deal, and Saudi leaders have repeatedly been quoted denouncing Iranian “meddling” in Syria, Iraq, Lebanon, Bahrain, and Yemen. A Saudi-led coalition of Arab states has also been fighting to dislodge Iranian-supported Houthi rebels in neighboring Yemen, where they've occupied the capital, Sana'a, since September. 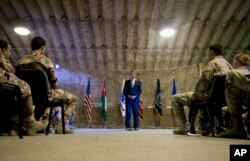 U.S. Defense Secretary Ash Carter talks to U.S. and Jordanian forces at a Jordanian air base, July 21, 2015. United Arab Emirates-based political analyst Theodore Karasik tells VOA he thinks Saudi leaders are not pleased by the Iran nuclear deal, but cannot afford to antagonize Washington at this point in time. Carter visited to Saudi Arabia followed stops in Israel and Jordan to assure the skeptical Mideast allies of continued American military support in the wake of the nuclear pact Tehran negotiated with the U.S., Britain, France, Germany, Russia and China. Later, he flew back to Jordan for a meeting with the Jordanian military leadership. Carter said ahead of his trip that he aimed to discuss American strategy to counter "Iranian aggression" in the region, as well as the fight against the Islamic State group. On Tuesday, Carter met with coalition troops in northern Jordan at an air base from where operations against targets in Syria are launched. He flew to Jordan from Israel, where he had met with Prime Minister Benjamin Netanyahu to provide reassurances of continued U.S. security support following the Iran’s nuclear agreement. Netanyahu greeted Carter with a somber face before going into nearly two hours of talks at his office in Jerusalem. Netanyahu issued a statement late Tuesday calling the Iran agreement "a bad deal" and "a historic mistake," and pledged to combat it through allies in the U.S. Congress. "It will put Iran at the threshold of an entire nuclear arsenal within a decade, because at that time the deal permits Iran to build as many centrifuges as it wants and to enrich as much uranium as it wants, which means that Iran could break out in a decade or so to dozens of nuclear bombs in zero time," the Israeli leader said. Carter is the first Cabinet-level U.S. official to visit Israel since Iran agreed last week to curb its nuclear weapons program in exchange for a partial lifting of economic sanctions against it. Relations between the United States and Israel have been strained by the agreement. But other analysts, including many former military and intelligence officials, weighed in to say the deal was not that bad. 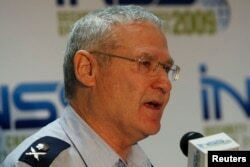 FILE - Major-General Amos Yadlin, Israel's chief of military intelligence, speaks at the annual Institute for National Security Studies (INSS) conference in Tel Aviv, Dec. 15, 2009. Amos Yadlin, director of Tel Aviv’s Institute for National Security Studies, called it "a highly problematic agreement that entails risks to Israel’s national security,” but he added that comparing it to a "dream agreement" whereby Iran would stop enriching uranium is unrealistic. "Had no agreement been reached," said Yadlin, "the infrastructure existing in 2013 [when the negotiations began] would have expanded even further to the point of immediate breakout capability, with no inspection regime in place." Scott Bobb contributed to this report from Jerusalem. Some material for this report came from Reuters. Will Iran’s Revolutionary Guard Support Nuclear Deal?